Join Us for Our 4th Annual Flamingo Week! We’re proud to announce our 4th annual Flamingo Week, starting May 15th and ending May 20th. Please join us for this week of fun, supporting Lower Cape Fear Hospice, and giving back to our community! Why Do We Do Flamingo Week? Flamingo Week is very personal to Occasions as Hospice was tremendously supportive to us during our time of need when my husband was dying of cancer in 2012. They made him comfortable and helped our family deal with the transition. We want to do whatever we can to make sure they can continue helping other families. This is our 4th year raising money for Lower Cape Fear Hospice. How Did Flamingo Week Begin? My husband, Jim, loved flamingos and amassed a small collection. 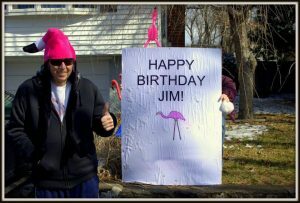 For his 55th birthday, which would be his last with us, I asked all of our family, friends, and co-workers to send him flamingo-themed cards hoping to get at least 55 of them. The response was overwhelming but the magic of those days was Jim’s smile every time he went to the mailbox. Even though he was incredibly ill, it was the highlight of his day to open all of the cards and packages with flamingo paraphernalia being sent. I had asked him what would I do with all of the flamingos after he passed and he responded: “put them up once a year to remember me”. My daughter was the one who suggested we also raise money for Hospice while exhibiting his collection. Hence, Flamingo Week was born. Even our logo was designed by my daughter to incorporate the magic of stationery and the love we had for Jim. The Flamingo Quill is a permanent reminder that life can be short, and that it should be full of love and laughter. So Flamingo Week is about us giving back to the community. It’s about helping Hospice and other families. And it’s about making people smile with all of the flamingos. Remembering the life of Jim Mahan and I think he would be proud of us for making a difference.